Here’s a fun NHL fact, which like all of the best facts about everything, is actually about The Simpsons. 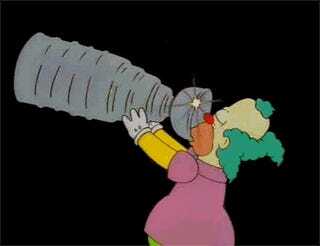 Way back in 1998, the NHL’s lawyers took issue with The Simpsons’ brief and vomitous use of the Stanley Cup. It occurred during the montage of Krusty’s bender in Season 9’s “The Last Temptation Of Krust,” and spurred the league’s lawyers to fire off a C&D. One that was completely ignored. That’s from former showrunner Mike Scully’s Twitter feed, which has been chock full of fun facts during the Simpsons marathon.